If you don't have the space a shower bath combo is the perfect alternative to a dedicated shower enclosure. You can still enjoy a long soak when you have the time or enjoy the convenience of a quick shower before the daily commute. 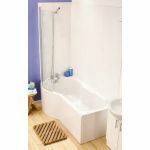 Shower baths tend to be oversized at one end for room whilst showering. This space is often described as p-shaped, b-shaped, j-shaped or square. This will also effect the shape of shower bath screen, many are curved whilst some are straight and incorporate a deflector panel. There are also options on the thickness of the acrylic or build construction of the bath. If the showering aspect will only be occasional then a thinner acrylic will be fine. For a more robust space that will get lots of use or for heavier users choose a thicker construction. Thermal jackets are also an option on some models, these keep your water warmer for longer.